About 120 survivors of the Dec. 7, 1941, bombing of Pearl Harbor observed a moment of silence to commemorate the Japanese attack and the thousands who lost their lives that day 70 years ago Wednesday. The moment of silence came just before 8 a.m. local time, when the first Japanese planes launched their attack. The survivors were joined by Navy Secretary Ray Mabus, military leaders and civilians at a ceremony in Pearl Harbor. Altogether 3,000 people attended the event at a site overlooking the sunken USS Arizona and the white memorial that straddles the battleship. President Obama hailed veterans of the bombing in a statement proclaiming Wednesday as "National Pearl Harbor Remembrance Day." "Their tenacity helped define the Greatest Generation and their valor fortified all who served during World War II. As a nation, we look to December 7, 1941, to draw strength from the example set by these patriots and to honor all who have sacrificed for our freedoms," he said. Also this week, five ash scattering and interment ceremonies are being held for five survivors whose cremated remains are returning to Pearl Harbor after their deaths. On Tuesday, an urn containing the ashes of Lee Soucy was placed on his battleship, the USS Utah, which is lying on its side near the place where it sank. The ashes of Vernon Olsen, who was on the Arizona during the attack, will be placed on his ship late Wednesday. The U.S. lost 12 vessels that day, but the Arizona and the Utah are the only ones still sitting in the harbor. 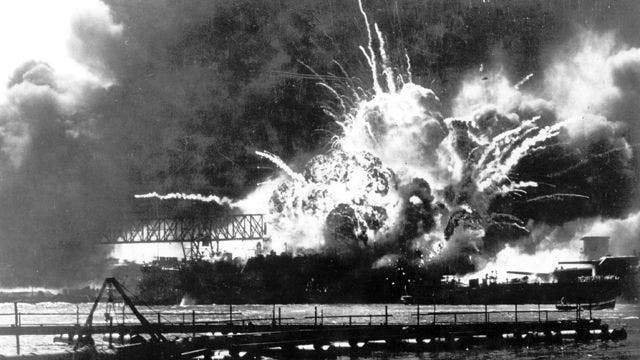 The attack brought the United States into World War II. The ashes of three other survivors will be scattered in the water in separate ceremonies this week.